The track was officially opened on the 31st July 2015. This video features students learning about bike safety and demonstrating how to undertake checks of helmets and bikes before riding. The track has varying degrees of difficulty with beginner, intermediate and advanced track options through the incorporation of features such as berms, rollers and bridges. Safety advice in this video includes knowing your limits when riding, ensuring you always leave a safe distance between yourself and other riders, and giving way to riders you encounter at track junctions. The location of the track is on the external school oval and can be accessed via the Cartwright street carpark. The track is a community resource and is available for the public to use outside of school hours. Students at our school use the track to support our involvement in the Ride and Walk to School program, they can also access the track as a lunchtime activity. 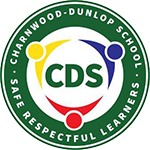 Other schools or organisations who wish to use the track during school time may make a booking by calling the Charnwood-Dunlop school front office on 6205 7322.